This is a cool jacket. And by cool I really mean warm and light. I used this jacket as my pillow almost every single night on the PCT. I wore it many times during the day in many different temperatures from 50* down to 20* and was amazed by its relative warmth when compared to its size and weight. I'm glad I brought this jacket. Here's why. Super compact and lightweight at only 7.8 ounces for my men's large. Well designed features and a trendy yet functional fit that was stylish. Zippered hand pockets to carry stuff in without having it fall out. Good water repellence and surprising breathability while still warm. Long enough sleeves and moderate chest to fit a tall skinny guy well. For $320 dollars this had better be a good 3-season jacket.That is expensive. Zipper failed near the end of the trip and required a warranty replacement of the zipper. (MH did a good job with the zipper, and even called me to ensure I had the color zipper I wanted). Great jacket that performs under duress. I washed it multiple time, wore it while hiking, slept in it and on it, and even used it as a sleeping quilt when my bag was too hot. Very functional and stylish design, and with careful use, an excellent choice for minimalists in any pursuit. I give this top marks, and enjoyed using it for this trip, where the weight savings was noticeable and much appreciated. 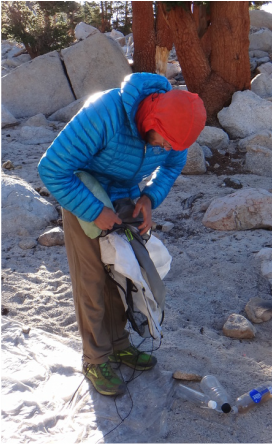 ** Comparison: I found this jacket to fit me better than the Western Mountaineering Hooded Flash jacket. This Ghost Whisperer jacket is about 2 oz. lighter and a much more trim fit than the WM which fits roomy in the chest. Quality of both jackets are great, fit is very different.